Perfect for residential or institutional use, the strong and portable FST-300 is the most affordable Free Standing Track system available. Weighing just 45 lbs. with no component weighing more than 17 lbs., the FST-300's lightweight frame allows for easy assembly. In fact, a single person can assemble the FST-300 in less than six minutes without the use of tools. Encompassing a height adjustment feature to accommodate for up to 7 ½ feet, the FST-300 fits a wide-range of transfer needs. 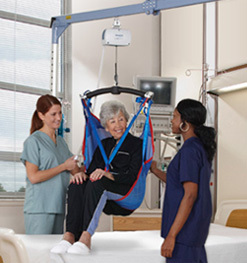 Its customized roller bag makes it easy to store and convenient for caregivers to transport. Safe working load of 300 lbs. Total weight is 46 lbs. No one component weighs more than 17 lbs.